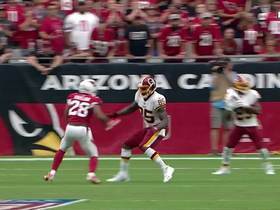 Thompson is pleased with his team's decision to re-sign fellow running back Adrian Peterson, Zach Brook of NBC Sports Washington reports. Thompson played 10 games in 2018, compiling 43 carries for 178 yards (4.1 average) along with 41 catches for 268 yards (6.5 average) and a touchdown on 55 targets. Thompson tallied four rushes for 20 yards and one catch (on one target) for eight yards in Saturday's 25-16 loss at Tennessee. Thompson (illness) rushed five times for nine yards and caught one of two targets for four yards in Sunday's 16-13 win over Jacksonville. Analysis: Thompson wasn't a major part of the game plan as neither offense found much success. 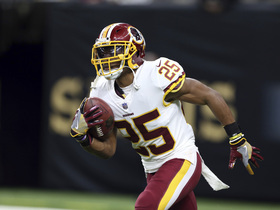 He's likely to cede the majority of rushing work to Adrian Peterson against the Titans in Week 16 if things stay close, but he's more capable of making an impact as a receiver out of the backfield if the Redskins find themselves in a hole. Thompson (illness) is active for Sunday's game in Jacksonville. Analysis: Thompson fell ill late in the week but recovered enough to be active for the third game in a row. In the previous two weeks, his workload was capped en route to six carries for 26 yards and six receptions (on 10 targets) for 33 yards. It's difficult to project much more production behind No. 1 back Adrian Peterson. Thompson (illness) , who is listed as questionable for Sunday's game against the Jaguars, is expected to play, John Keim of ESPN.com reports. Analysis: While fantasy owners would be wise to check Thompson's status prior to Sunday's 1 p.m. EST kickoff, it appears as if the veteran running back has made enough progress in his recovery from the illness to suit up. Thompson has just 59 total yards in the two games since returning from a rib injury that kept him out of four contests. Thompson missed Friday's practice with an illness and is listed as questionable for Sunday's game at Jacksonville, JP Finlay of NBC Sports Washington reports. Analysis: With two full days to recover, Thompson should still have a good chance to suit up as his team tries to stay in the playoff hunt. He's been quiet since returning from a lengthy absence due to a rib injury, but the Redskins may have a larger role in mind with Jordan Reed (toe) out of the lineup and Josh Johnson starting at quarterback. Sunday's kickoff is scheduled for 1 PM ET. Thompson caught three of five targets for 15 yards and took three carries for 23 yards in Sunday's 40-16 loss to the Giants. Thompson ran for three yards on three carries and added 18 yards on three catches during Monday's 28-13 loss to the Eagles. He fumbled during the contest, but the offense maintained possession. Thompson (ribs) logged another full practice Friday, Kareem Copeland of The Washington Post reports. Thompson (ribs) was a full participant in Thursday's practice. Thompson (ribs) said Monday he's encouraged by his progress and is hopeful to play Week 13 at Philadelphia, John Keim of ESPN.com reports. Analysis: Thompson reportedly looked sharp during individual drills at Monday's practice, taking a big step forward after he failed to participate in any fashion the past four weeks. He seems to be on track for at least a limited practice Thursday when the Redskins release their initial Week 13 injury report. 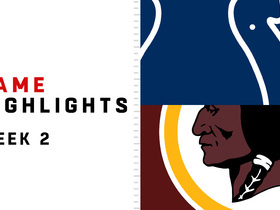 After their previous game came Thanksgiving Day against Dallas, Washington will have 10 full days to prepare for the Monday night matchup with the Eagles. Thompson (ribs) went through individual drills Monday, Kareem Copeland of The Washington Post reports. Analysis: Unable to practice in any capacity last week, Thompson was held out for a sixth time in seven games when Washington lost to Dallas on Thanksgiving Day. 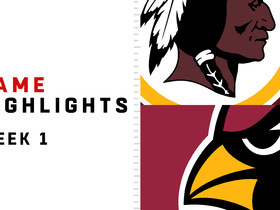 He now hopes to take advantage of a long break between games as the Redskins prepare for a Monday night matchup with the Eagles in Week 13. The early signs hint at some chance for a return, with JP Finlay of NBC Sports Washington noting that Thompson looked quick during Monday's practice. Thompson (ribs) has been ruled out for Thursday's game in Dallas, Jake Kring-Schreifels of the Redskins' official site reports. Analysis: Listed as a non-participant all week, Thompson will be held out of action for the sixth time in seven games. The Redskins will use Kapri Bibbs and/or Byron Marshall on passing downs in quarterback Colt McCoy's first start of the season. Thompson (ribs) was a non-participant in Tuesday's practice, David Helman of the Cowboys' official site reports. The running back was instead limited to working out on a side field under the watch of trainers, according to John Keim of ESPN.com. Analysis: Thompson was always in an uphill battle to gain an active status on a short week, and his absence from practice Tuesday supports the notion the running back will more than likely be sidelined Thanksgiving Day in Dallas for the sixth time in seven games. A final call on Thompson's gameday status will be made following Wednesday's practice session, but the expectation is that Kapri Bibbs and Byron Marshall will shoulder most of the scatback's duties on passing downs. Thompson (ribs) was listed as a non-participant on Monday's estimated injury report. Thompson (ribs) has been ruled out for Sunday's game against the Texans. Analysis: Limited to side work with the training staff this week, Thompson is still in too much pain to play in a game. Kapri Bibbs will continue to fill in for Thompson on passing downs, with Byron Marshall (knee) likely to return from injured reserve to replace an injured Samaje Perine (hip) in the No. 3 role out of the backfield. Thompson may have a hard time avoiding another absence with Redskins playing in Dallas on Thanksgiving Day in Week 12. Thompson (ribs) isn't participating in practice Friday, Kareem Copeland of The Washington Post reports. Analysis: Thompson worked out on a side field Thursday but was listed as a non-participant. He seems to be headed for a third straight absence when the Redskins host the Texans on Sunday, though it's possible he'll be listed as questionable on the team's final injury report. Thompson (ribs) didn't participate in practice Thursday, Kareem Copeland of The Washington Post reports. Coach Jay Gruden said Thompson (ribs) is unlikely to suit up for Sunday's game against the Texans, John Keim of ESPN.com reports. "I can't do anything outside of being uncomfortable standing for too long, sitting for too long," Thompson told Kareem Copeland of The Washington Post. "I've just got to focus on trying to get better and being patient, because sometimes with ribs it can happen quick or it can be a slow process." 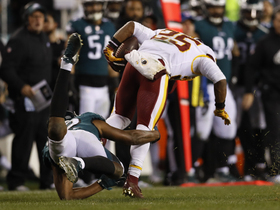 Analysis: Thompson has been available just one time in the Redskins' last five contests, the result of a pair of rib injuries. He hasn't set himself up well this week with no reps at Wednesday's practice, but two sessions remain for the running back to change the tone about his potential to play. Thompson (ribs) is still dealing with considerable pain and isn't sure when he will be ready to play, but he did say his injury is improving, Kareem Copeland of The Washington Post reports. "I can't do anything outside of being uncomfortable standing for too long, sitting for too long," Thompson said. "I've just got to focus on trying to get better and being patient, because sometimes with ribs it can happen quick or it can be a slow process." Analysis: Thompson has missed four of the past five games due to two separate rib injuries, unable to practice in any capacity the past two weeks. It sounds like he could make it back to limited participation in the coming days, potentially setting up a game-time decision Sunday against the Texans. Kapri Bibbs will continue to handle passing downs out of the Redskins backfield if Thompson ultimately ends up missing another week. Thompson (ribs) has been ruled out for Sunday's game at Tampa Bay, Kareem Copeland of The Washington Post reports. Analysis: Thompson was unable to participate in the first two practices during Week 10 prep, so the Redskins opted for a proactive approach and will give the pass-catching back more time to recover from an injury to his rib cage. In Thompson's stead, expect Kapri Bibbs to handle the change-of-pace role behind Adrian Peterson, though deep reserve Samaje Perine may also be utilized out of the backfield. Thompson's next chance to attempt to return will be Sunday, Nov. 18 versus the Texans. Thompson (ribs) wasn't spotted taking part in practice Thursday during the portion of the session that was available to the media, John Keim of ESPN.com reports. Analysis: Thompson hasn't practiced in any fashion since re-injuring his rib cage Oct. 28 against the Giants and appears on track to miss his fourth game of the season Sunday versus the Buccaneers. Assuming Thompson can't go, Kapri Bibbs would work as the Redskins' primary passing-down back. Thompson (ribs) isn't practicing Wednesday, John Keim of ESPN.com reports. Analysis: Thompson returned from a two-game absence Oct. 28 against the Giants, but he suffered a new rib injury in the process and didn't practice at all last week. Now dealing with pain on both sides of his rib cage, the veteran pass-catching back is looking shaky for Sunday's game in Tampa Bay. Another absence would free up passing-down work for Kapri Bibbs, who doesn't warrant the same level of involvement in the Washington offense. Thompson (ribs) has been ruled out for Sunday's game against Atlanta, JP Finlay of NBC Sports Washington reports. Thompson (ribs) isn't practicing Friday and doesn't seem likely to be available for Sunday's game against Atlanta, JP Finlay of NBC Sports Washington reports. Thompson (ribs) didn't take part in practice Thursday, John Keim of ESPN.com reports. Analysis: After missing two games due to knee and rib issues, Thompson returned this past Sunday against the Giants but injured the other side of his rib cage. Despite failing to practice yet this week, he has rid himself of the knee injury that plagued him for the better part of October, per the Redskins' practice report. 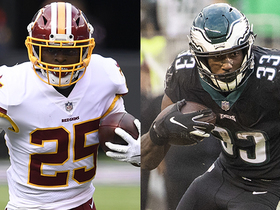 Beyond Adrian Peterson (shoulder), the Redskins backfield truly is in flux, as Kapri Bibbs separated his left shoulder Week 8 and Samaje Perine has been active just twice this season. 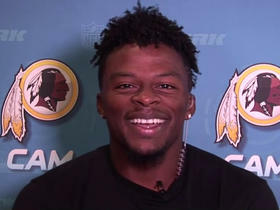 Redskins running back Chris Thompson talks about his relationship with rookie running back Derrius Guice. 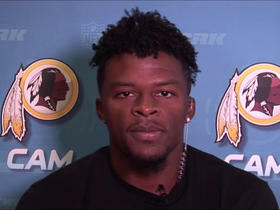 Redskins running back Chris Thompson talks about sharing the backfield with running back Adrian Peterson. 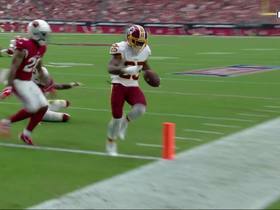 Washington Redskins running back Chris Thompson accelerates for a 23-yard gain off a screen pass from quarterback Alex Smith. Washington Redskins quarterback Alex Smith dumps off a pass to running back Chris Thompson for a 13-yard touchdown. 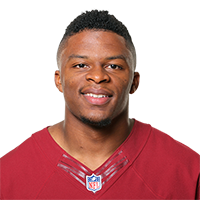 NFL Network Insider Ian Rapoport brings the latest information on the injury to Redskins running back Chris Thompson.